Dance Commentary by Heather Desaulniers: "The Lost Boys"
Multi-discipline performance; dance theater; new/mixed media. Chances are if you are headed to a modern dance concert in 2014, it is actually one of these genres that you will be seeing. Choreography and movement mixed with sculpture, costuming, visual art, sound and/or videography has certainly permeated today’s dance field. Some of these interdisciplinary attempts fare better than others. Too often, the connection between additional performance elements and the dance is at best, tenuous. The stage gets peppered with extra ‘stuff’ that is not relevant, relative nor resonant. And in most cases, these extras actually distract from otherwise sound choreography. But even though multi-genre dance clearly hasn’t won me over yet, even I can admit that when done well, the results can be extraordinary. And quite often, what separates a ‘successful’ interdisciplinary dance work from the rest of the pack is that the choreography and the movement retain top billing, while the other entities play an integral, albeit supporting, role. Kevin Williamson’s “The Lost Boys” is an example of how mixed-disciplined work can go very, very right. 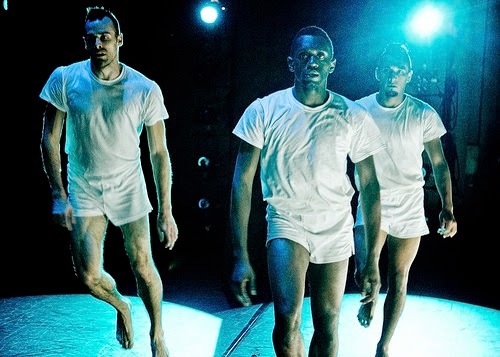 Currently at CounterPULSE in San Francisco’s Mission District for a two-performance run (with the final show this evening), “The Lost Boys” is an evening-length mens quartet combining dance with vocalization, props, text and lighting. “The Lost Boys” tackles a very specific narrative – the 1980s AIDS crisis and how it affected those who grew up during that tumultuous period. A complex, layered theme, such as this, actually lends itself well to a multi-genre performance style. The choreography and movement were the primary mode of communication, speaking to the high level, deeper narratives: the search for love and companionship, the experience of being in community yet still feeling alone, the attempt to traverse a personal journey amidst outside forces. The ‘other’ theatrical entities assisted the dance by providing framing and context, most important, placing the action into Williamson’s chosen historical era. Harsh, stark fluorescent lights signaled the beginning of the work as the four men took the stage. Once in place, they began a lengthy arm movement phrase - expansive yet controlled motions in very tight proximity. Their physical juxtaposition implied intimacy, but the four never actually touched. Here was a community that was close, yet still maintained purposeful distance from each other. And this space between ‘the real’ and ‘the veneer’ would come back again and again, but in creative new ways. Early on, the musical influences set the stage with some well-chosen selections from mid- to late-1980s. Williamson opted to combine recordings with live singing/speaking of the lyrics. Though there was snippets of eighties choreography present in the dance itself, it was really these song selections (in each form) that made the time period clear. In the middle of “The Lost Boys”, the cast embarked on the main modern dance sequence. From Williamson’s choreographic construction to the performance of the elements to the narrative undertone, it was flawless. This portion was all about strength – strength of composition, strength of technical ability, strength of character. Club dance mixed with classic grand pliés in first position; Capoeira influences fed into re-imagined renversés; and full split jetés walked alongside pedestrian tasks. Throughout the piece, a spitting motif recurred, and it wasn’t pantomimed - the dancers actually spit at and on each other. At first, the spitting was a little shocking and frankly, pretty gross. But because Williamson utilized the dance theater tool of repetition, after a while you were anesthetized to it. Getting used to seeing the spitting on stage also allowed the narrative to emerge. The spitting was violent, powerful and desperate, and above all, very personal. It encapsulated real levels of fear and frustration that had nowhere else to go. Text-work also revealed this internal/external struggle. A trio repeated the sentence “you’re fine” over and over. What started as internal reassuring quickly morphed to external objectification. Repeated sauté jumps in parallel passé also spoke to the difference between reality and pretense. The cast jumped high in the air with pasted on smiles that instantly dissipated once they landed. And in a surprise move, Williamson closed the fifty-minute work with an incredibly tender duet. “The Lost Boys” came full circle with this final statement of vulnerability, care and attention after much conflict, strife and discomfort.